So much good to think about. I LOVE to listen to his words but, as usual, I have to change something about me because his words have a way of convicting as well as explaining. I love Jack! This book was seminal in my return to the Christian faith when I was in my late 20's. 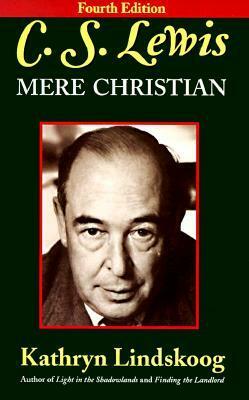 I realize that many people might say this about the book entitled "Mere Christianity" by C.S. Lewis. However I started by reading a book ABOUT Lewis instead. Kathryn Lindskoog is noted as being one of the foremost C.S. Lewis scholars. Chapter titles in this book include "Reality: What is life all about?" "Destiny: What Will Become of Us?" and "Culture: What is our World View." This book had a similar impact on me that "Mere Christianity" had on others. It challenged my belief system and it was an invitation to reconsider the meaning of life's deepest struggles. This excellent book will always have a soft place in my heart. I strongly recommend this book!! So far, all I have read by C. S. Lewis are his Chronicles of Narnia and Letters to Malcolm. After reading this book about him by his friend, Kathryn Lindskoog, I strongly want to read everything he ever wrote. I loved her explanations of his views on various topics and her descriptions of him at different times in his life. I already loved him from reading his Narnia books and it is always heartwarming to meet up with another admirer of his. This was a very interesting biography. So many truths gave me lots to think about. I wish I'd read more of his books before reading this. The author does a great job of explaining the literature, but it would have been helpful to be familiar.I recommend this book to people looking for truth and fans of CS Lewis. This author was a professor of mine at Fuller Theological Seminary. An excellent C. S. Lewis scholar, this was a required text in her class on the liturature of C. S. Lewis. I especially enjoyed her take on the story of J. B. Philips meeting with C. S. Lewis. I willnot spoil it by telling you about it. Just get the book and read it for yourself! Brilliant. Persuasive, but logical. Filled with wonderfully endearing prose, as it's based on transcripts from radio broadcasts Lewis made during the war. I would have listened most earnestly had I been around then. Instead I'm listening now. Not really written by C. S. Lewis? Second time through this read for me. Very insightful and thought provoking. Makes me examine my internal motives for my external behavior more. Very interesting view of C.S. Lewis and his life and his focus on Christianity in his writing and lifestyle. Some may find this book challenging, but it is definitely worth reading. Good read, but very intellectual. With every decision you make, you are slowly and surely creating a person that can either live with God's love, or someone who cannot. Great summary of Lewis' thought for any student of the Oxford Don.